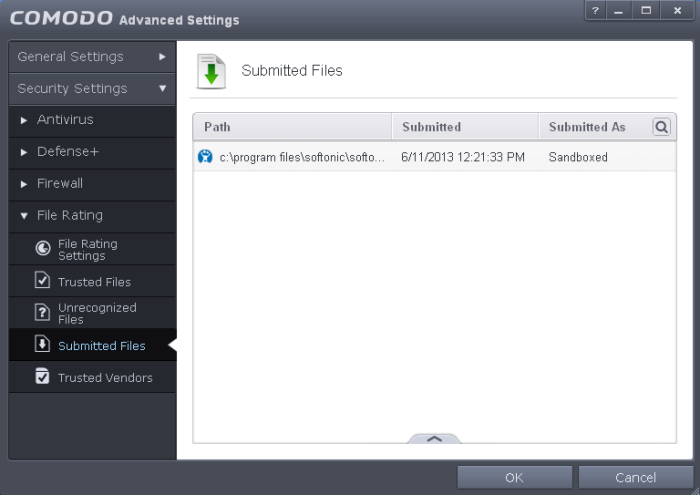 The Submitted Files panel displays a list of files you have submitted so far for analysis to Comodo. You can use the search option to find a specific file in the list. To use the search option, click the search icon at the far right in the column header. Click the chevron on the left side of the column header and select the search criteria from the drop-down. Enter partly or fully the file path or the submitted status as per the selected criteria in the search field. Click the right or left arrow at the far right of the column header to begin the search. Click the icon in the search field to close the search option.